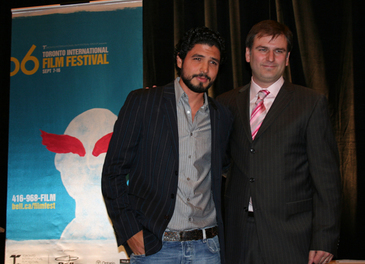 Alejandro Monteverde’s “Bella” from Mexico won the people’s choice prize at the festival, while the FIPRESCI film critics award went to Gabriel Range‘s “Death of a President” and the award for a film in the Discovery section was presented to Joachim Trier for his film, “Reprise.” In other awards, the new cultural innovation prize for a film in event’s Visions section went to “Takva – A Man’s Fear of God” directed by Ozer Kiziltan and in awards to Canadian films, Jennifer Baichwal‘s “Manufactured Landscapes” won the best Canadian film award, while Noel Mitrani‘s “Sur la trace d’Igor Rizzi” (“On the Trail of Igor Rizzi“) won the prize for best Canadian first feature film and Maxime Giroux‘s “Les Jours” (“The Days“) won the Short Cuts Canada prize. Set in New York, Monteverde’s feature directing debut “Bella” found its U.S. distribution prospects brightened in light of Saturday’s Toronto audience prize. An emotional story about a recently fired waitress who finds out she’s pregnant, the film sees her facing the prospect of no money and no emotional support until she finds a friend facing his own demons and through her new ally, she decides to reevaluate her own future. The Spanish language title, one of just two films being sold by ICM in Toronto, will be screened again in New York and Los Angeles for buyers as reps eye a deal for the film. “Bella” director Alejandro Monteverde with festival co-director Noah Cowan on Saturday, where he was awarded the people’s choice award. Photo by Brian Brooks/indieWIRE. Cowan: Fest Sees Record Business in U.S. Detailing what he called “a huge change” in the Toronto marketplace for films seeking U.S. distribution, festival co-director Cowan predicted that as many as 40 new festival films will find significant U.S. distribution out of the 2006 festival. Sitting with indieWIRE on Friday morning he tackled the view by some that “there’s nothing to buy here” and spoke at length about the event, walking us through the entire roster of 352 festival films to discuss each film either in play, most likely to land a U.S. distribution pact, and even a few that are “on the cusp” as buyers head home and take stock. Admitting that he was at first a bit concerned when the fest lineup didn’t yield immediate deals in the opening days of the festival, Cowan said that he checked in with buyers and sellers at the event’s midpoint and realized that while some pacts may take even until November’s American Film Market (AFM) before closing, the results are in fact quite striking. 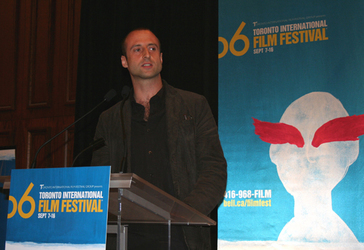 Well known for a massive program and large crowds, the festival offered some 106 world premieres this year and while Cowan emphasized that he puts the local audience first, its clear that the 3,000 industry sales delegates from over 500 companies and 67 countries are quite important, particularly those in the U.S. market where Cowan once ran a distribution company. The development comes at a time of continued change within the distribution landscape with the larger specialty divisions of the Hollywood studios, companies like Paramount Vantage, Fox Searchlight, and Focus Features, putting most of their money into production and often looking to festivals like Toronto for genre titles. Meanwhile, on the other end of the spectrum smaller companies are developing new strategies to market and distribute niche titles, leading to an increased level of buying from outfits like IFC Films and Netflix. Even so, stalwart indie and foreign language distributor Sony Pictures Classics has yet to find a film in the festival lineup and may end up with nothing out of Toronto. Among the pre-fest pacts for Toronto premieres included Samuel Goldwyn Films and Roadside Attractions deal for the fest closing night movie “Amazing Grace,” IFC Films’ acquisition of “…So Goes The Nation,” The Weinstein Company‘s deal for “Dixie Chicks: Shut Up and Sing,” ThinkFilm‘s signing of “10 items or less, and MGM‘s “Rescue Dawn” pact. “Death of a President” director Gabriel Range, who received the FIPRESCI film critics award Saturday at the Toronto International Film Festival. Photo by Brian Brooks/indieWIRE. Predicting acquisition deals is difficult and such prognonstications are subject to change — some pacts may take time, other may fall through, but among the films (by section) most likely to find U.S. distribution, including those that have signed unannounced pacts, or others nearing or anticipating a U.S. sale are: in the Gala section, Zacharias Kukuk and Norman Cohn’s “The Journals of Knud Rasmussen,” Mark Palansky’s “Penelope,” Christopher N. Rowley’s “Bonneville,” Patrice Leconte’s “My Best Friend” (“Mon meilleur ami“), and Paul Verhoven’s “Black Book” (“Zwartboek“), while in the Masters section there are Margarethe von Trotta’s “I Am The Other Woman” (“Ich bin die Andere“), Alain Resnais’ “Coeurs“. In other sections, films expected to secure a U.S. release are: Peter Brosens and Jessica Woodworth’s “Khadak” and Julia Loktev’s “Day Night Day Night” in the Visions section, Antti-Jussi Annila’s “Jade Warrior,” Jean Marc Barr and Pascal Arnold’s “Chacu sa nuit,” and Murali K. Thalluri’s “2:37” in the Vanguard section. In the Special presentation section, additional titles include: Shane Meadows’ “This Is England,” Hong Sang-soo’s “Woman on the Beach” (“Haebyunei Yeoin“), Hirokazu Kore-eda’s “Hana,” Eytan Fox’s “The Bubble,” Alek Keshishian’s “Love and Other Disasters,” Emanuele Crialese’s “Golden Door” (“Nuovomondo“), Michael Ian Black’s “The Pleasure of Your Company,” Jennifer Baichwal’s “Manufactured Landscapes,” all in the Special Presentations section. While in the Contemporary World Cinema section there are Larry Fessenden’s “The Last Winter,” Alejandro Monteverde’s aforementioned “Bella” and John Jeffcoat’s “Outsourced,” and docs in the Real to Reel section, including Asger Leth’s “Ghosts of Cite Soleil” and Lucy Walker’s “Blindsight.” While in the Discovery section there is Robert Sarkies’ “Out of the Blue,” along with Andrew Currie’s “Fido” in the Canada First! section, and Jonathan King’s “Black Sheep” and Nacho Cerda’s “The Abandoned” in the Midnight Madness section. That would put the Toronto fest new feature list of pre-sold, announced, pending and expected deals at 40, leaving another 10 films that seem to have potential for a U.S. pact, including Feng Xiaogang’s “The Banquet” (“Yeyan”), Ozer Kiziltan’s “Takva – A Man’s Fear of God,” Ethan Hawke’s “The Hottest State,” Agustin Diaz Yanes’ “Alatriste,” Tarsem’s “The Fall,” Bahman Ghobadi’s “Half Moon” (“Niwemang”), AJ Schnack’s “Kurt Cobain About a Son,” Paul Andrew Williams’ “London to Brighton,” Daniel Sanchez Arevalo’s “DarkBlue AlmostBlack,” and “Trapped Ashes,” from a group of directors. The final premiere of the 31st Toronto fest came at Saturday’s closing night gala, via filmmaker Michael Apted who explained that with the aforementioned “Amazing Grace” he finally had a chance to tackle a topic he’s been wanting to explore for some time: politics. The film, starring Ioan Gruffudd, looks William Wilberforce’s move to abolish slavery in Britain. As a young member of parliament, Wilberforce strategically found a way to bring about the change, despite significant opposition. Samuel Goldwyn Films and Roadside Attractions will release the film in the United States on February 23, 2007, the 200th anniversary of the signing of the act that banned slavery within the British Empire. The film co-stars Romola Garai, Rufus Sewell, Benedict Cumberbatch, Youssou N’Dour, Ciaran Hinds, Michael Gambon, and Albert Finney.